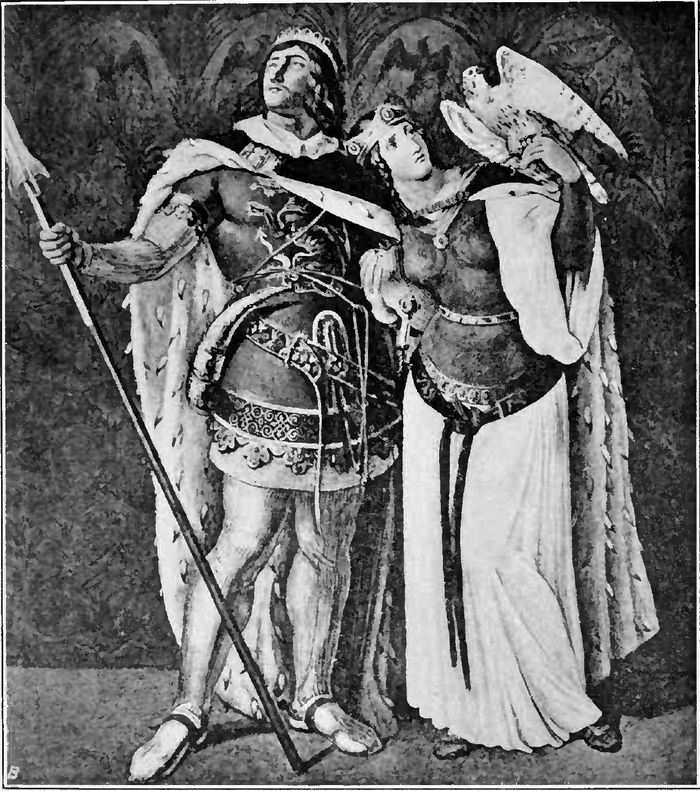 The unknown writer of the Nibelungenlied, or Lay of the Nibelungs, was an Austrian. Nothing is known of him except that he wrote his celebrated ballad epic toward the end of the Twelfth Century. Rediscovered toward the end of the Eighteenth Century, the Lay is, in the words of Prof. Calvin Thomas, “a powerful poem and a human document of many sided interest.” The component episodes are related with great vivacity, and the characters developed by means of a powerful imagination. The Lay was founded upon earlier versions of various legends, traditions, and songs that were current in pre-Christian times. Many of the same stories are found in the two Icelandic Eddas and in the Volsunga Saga. The present version comprises two chapters, or “Adventures” (the fourth and fifth) of The Fall of the Nibelungs, translated by Margaret Armour, Everyman’s Library. Reprinted by permission of the publishers, J. M. Dent and Sons. There is no title in the original. Now there were brought into Gunther’s land strange tidings by envoys sent from afar by foreign princes that hated him; and when they heard the message they were troubled. The kings were as I will tell you: Ludger of the Saxons, a high and mighty prince; and I budgets of Denmark, and many bold warriors with them. These envoys, sent by his foemen, came into Gunther’s land, and the strangers, were asked their business, and brought before the king. The king greeted them fair, and said, “I know not who hath sent you hither, and would hear it.” So spake the good king, and they greatly feared his wrath. “If thou wilt have our message, O king, we will tell it plain, and name thee the princes that have sent us. They are Ludgast and Ludger, and will come against thee into thy land. Thou art fallen in their displeasure, and we know that they bear thee bitter hate. They come hither with an armed force to Worms by the Rhine—they and their warriors. Wherefore be warned. Inside of twelve days they will ride. They bade lodge the envoys in the town. Albeit they were his foemen, Gunther, the great king, commanded the folk to entreat them well— rightly he did so—till that he knew the friends that would stand by him.